Using the right tool for the job when doing food prep is essential to getting things ready quickly and precisely. If you know your way around a kitchen or are interested in breaking down your own meat, a good boning knife is key. We researched some of the best options available to help you narrow down which is the best one for you. Before we get started, let’s take a look at some of the key features to keep in mind. Length: This is the length of the blade. Overall knife lengths vary but the blade is the most important part so we wanted to include it. Almost all of these have a 6-inch blade, though there are exceptions in either direction. Blade Material: All of these blades are made of some sort of steel, but there are some variations. Japanese and German stainless steel are both popular as is high-carbon steel. All of these are great choices capable of holding a good edge. Dishwasher Safe: Some of these are dishwasher safe but most of the manufacturers recommend handwashing. Dishwashers can be tough on cutlery so the best way to make sure the blade stays intact is to hand wash it. Handle Material: Whether you’re looking for a PakkaWood, steel, rubber, or plastic handle, you’ll find it here. Make sure whatever material you choose offers a good, solid grip. This gives you more control and is safer when you’re working. Style: These knives come in 2 styles: straight and curved. This is really your personal preference. Some people think a curved blade is more precise and provides the user more control. Others prefer straight blades for the same reasons. Warranty: A lot of these knives come with a lifetime warranty, which is really great. Make sure you know what’s covered and what isn’t and follow the manufacturer’s recommendations for care so you don’t void the warranty unintentionally. Now that you know what to look for, let’s move into our boning knife reviews. Here, you’ll find everything from a simple knife for your kitchen to a professional boning knife. If you’re in a hurry, start at the top of the list with our top and budget picks so you can check them out even if you don’t have a lot of time. Ready for the next part of our boning knife buying guide? Let’s go! This product from Dalstrong isn’t just the best professional boning knife we found in our research. It’s also one of the best looking knives we’ve ever seen. The sharp, straight edge knife is polished to a mirror-like finish. It’s also nitrogen cooled. What does that mean? It’s made with enhanced hardness, flexibility, and it’s resistant to corrosion. It has a full tang for better handling and triple rivets for extra stability. 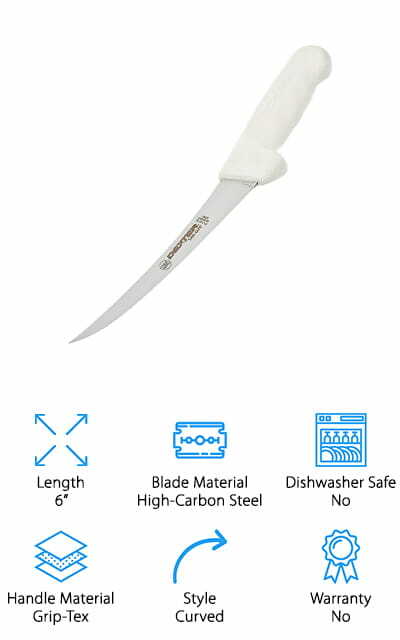 The blade is shaped to minimize surface resistance for smoother, more precise cutting and it comes with a sheath for safekeeping when not in use. As for the handle, it’s ergonomic design was made for comfort and added control. As if that wasn’t enough, this knife also comes with a 100% satisfaction money back guarantee and a lifetime warranty against any defects. Up next is our budget pick, the best cheap boning knife we could find. The Mercer Culinary Millennia Knife has a high quality, Japanese steel blade. Japanese steel is high carbon, extra hard, and easy to maintain. It won’t stain and sharpens quickly to a razor sharp edge. The handle on this knife is pretty great, too. It’s ergonomically designed and has textured finger points so it’s safe and comfortable in your hand. There’s even a protective finger guard for additional safety. And get this: it’s available in 8 different handle colors. Choose from black, blue, brown, green, purple, red, white, or yellow to put a little bit of personality into your food prep. This knife has an NSF certification, which shows that it’s been independently tested for performance, quality, and safety. If you’ve been waiting for a Victorinox boning knife review, here it is. This Victorinox 6-inch boning knife has a curved, flexible blade that’s perfect for thinner cuts of meat that are tender and have an intricate network of bones, like chicken or fish. In fact, this might be the best boning knife for chicken. The handle is made of Fibrox, which provides a textured, slip resistant design and an ergonomic handle for balance, comfort, and control. You’ll be able to get a good grip on this knife even when it’s wet or oily. This product has been made in Switzerland since 1884 for those people who spend all day, every day working in the kitchen. It’s NSF certified and made to the highest sanitary standards meaning it’s dishwasher safe, hygienic, and safe to use. For a good boning knife that professional and amateur chefs will love, take a look at the Wusthof Classic Boning Knife. The full-tang is forged from a single piece of high-carbon stainless steel and is both flexible and precise. We think this is not only the best boning knife for beef, it’s also ideal for pork and chicken, too. The handle is made from a durable synthetic material called polyoxymethylene. This material has a tight structure that won’t fade or discolor. There are 3 rivets holding the blade in place for added strength. Plus, the handle also has a full bolster, finger guard, and the brand’s red trident logo. One more thing, the blade has precision edge technology. What does that mean? It’s 20% sharper and the edge lasts twice as long. The next de boning knife on our list is from J.A. Henckels. It has a full tang with triple rivets for superior balance, strength, and control. The blade itself has a satin finish that not only looks great, it also helps the blade slide smoothly while you work. This is a highly durable blade that’s ideal for cutting, peeling, and slicing all kinds of meat. The handle has an ergonomic design that is not only comfortable, it’s safe, too. One more feature we want to mention is the JA Henckels logo that appears on the metal end cap. This is an inexpensive knife from a brand known for its high quality cutlery. If you’ve been wanting a J.A. Henckels knife but don’t want to pay a lot, this entry level option is a great choice. For a high quality, commercial boning knife, we were really impressed with this one from Shun Gokujo. 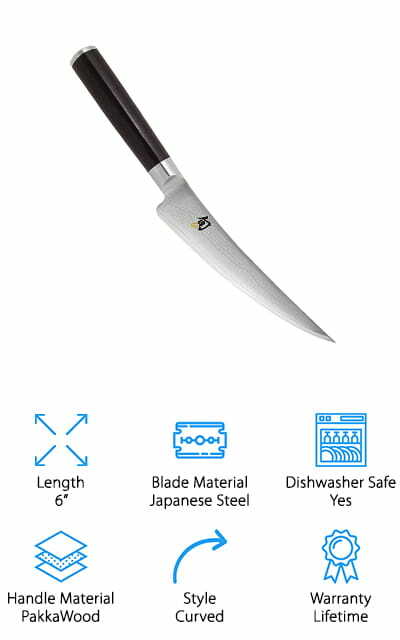 It’s precision forged in Japan and, get this, it has 33 layers of Japanese steel which is known to hold its edge. It also has superior strength and flexibility plus it’s corrosion resistant. Because of the way the steel is layered, there are microscopic air pockets along the blade which helps reduce friction for a smoother and more accurate cut. The handle is made of PakkaWood, which is hardwood that’s been impregnated with resin that’s certified for use in commercial kitchens. The manufacturer recommends hand washing and drying. Because it comes with a limited lifetime warranty, it’s best to avoid the dishwasher so as not to cause any problems with the warranty if you ever need to use it. 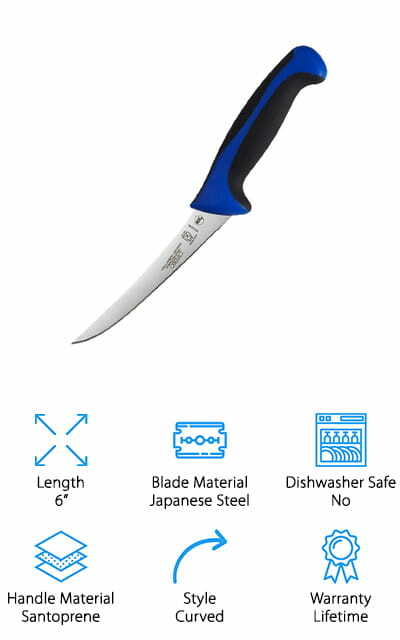 The carbon steel boning knife from Update International has a hand-honed curved blade that performs really well. It’s made of German high-carbon steel with vanadium, which adds corrosion and abrasion resistance. It also helps protect the blade from breakage or fracture. 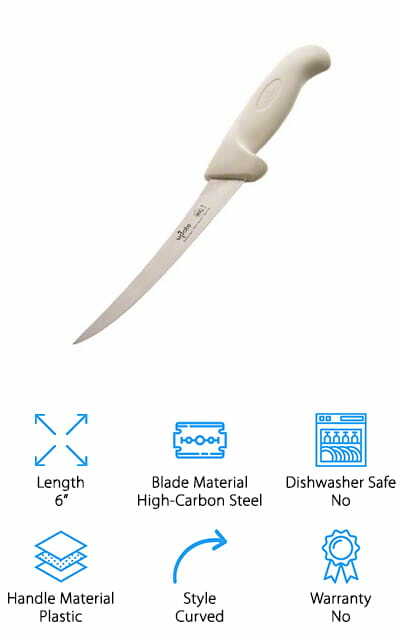 This knife is NSF approved and can be used in commercial kitchens. It’s incredibly sharp and effective while also being ridiculously affordable. Another thing that stands out about it is the handle. For one thing, it’s white which gives this knife a unique look since most knives have black handles. It’s also made of thick, chunky rubber which gives you a nice, non-slip surface to hold on to. Because it’s such an affordable option, we think this is the best boning knife for deer if you’re looking for something to use to process your own venison at home. The Global Cromova Boning Knife is our next best boning knife review. This lightweight, straight-edged knife has a flexible vanadium stainless steel blade. Why vanadium? It resists corrosion and abrasion and prevents fractures. The blade holds its edge very well, too. 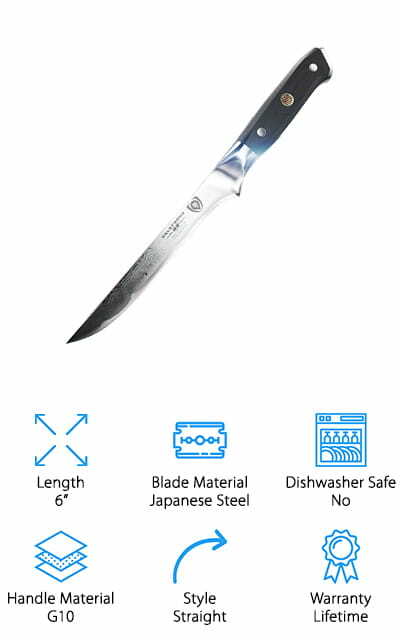 These knives were created in Japan and so have a slightly thinner blade than their European cousins. Something cool about this knife is that the handle is also made of stainless steel. It looks quite impressive as it’s really just one long piece of shiny metal. The handle is molded to fit into your hand and has strategically placed dimples to create a textured grip for you to hold onto. And get this, the handle is actually hollow and filled with just the right amount of sand to maintain the right balance. If you like a boning knife with a curved blade, check out the Dexter-Russell Boning Knife. It’s made of high-carbon steel for increased durability. That means it will keep its edge for a long time. Plus, once it does start to dull, it’s easy to bring it back. The blade curves upward and has a sharp end to get the knife properly positioned inside the meat quickly and easily. It’s also flexible and easy to maneuver which makes it a great choice for working about fish and poultry with small, delicate bones to get around. The white handle has a grippy surface and is sealed around the blade to keep bacteria out since there are no little nooks and crannies for them to hide in. The handle is also really easy to clean. Last in our list is our pick for best boning knife for butchers, the TUO Cutlery Boning Knife. It has a blade that’s a little longer than all of the other blades we’ve covered so far. At 7 inches, the German stainless steel blade is really thin, super flexible, and really easy to use for deboning fish, meat, and poultry. The razor sharp edge gives minimal resistance and is easy to maneuver. That’s not all, it’s also made to last a long time because it’s resistant to rust and corrosion. The PakkaWood handle is comfortable to hold and the full tang provides excellent stability and control. It comes packaged ready to give as gift but you’ll probably want to keep it for yourself. One more thing, it also includes a 100% satisfaction, money back guarantee.